I did an intro of myself in an earlier post. I just recieved a Concert Master violin recommended by Fiddlerman and thought i'd give my impression so far. It looks much more expensive than it is. Wonderful sound, clean and powerful. Even on all strings. I usually play fiddle tunes, but i love vibrato on this instrument. Especially the d string. Vibrate on that and it just moves me. The back is stunning. More beautiful than i expected. Pegs work perfectly. I would have liked a lower bridge because i have carpal tunnel syndrome, but it is cut right. That's just me, as i usually cut them low. I have two other violins, one of which cost me $1600 and it is not as easy to play. Sound comparison, it's a draw. So i would say, Fiddlerman is offering a real bargain here. I like the strings that come with it. In fact i ordered another set. I was hesitant to order any recommended stuff, but after playing this i ordered his CF bow. I'll give you my thought when i get it. i'm gonna post a pic, i hope i do it correctly. 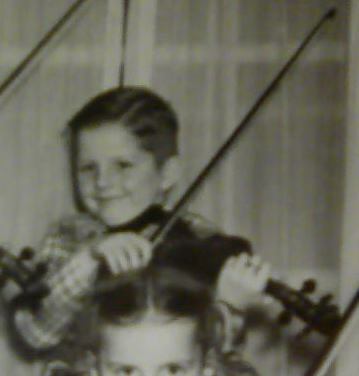 I have two other violins, one of which cost me $1600 and it is not as easy to play. Sound comparison, it's a draw. Welcome to the forum, telltom. Hope you will enjoy your stay here. Congrats on your new violin. Yes, it's a beauty. From the picture, it does look like one piece back, right? Could you give a bit more detail about your other violin for comparison, and about "it is not as easy to play". Some people here, including myself, don't have the opportunity comparing some expensive violins. Yes i stated the CM was easy to play. What i mean by that is a hard thing to explain. What it comes down to is the feel of the neck in your hand and the bridge angle. If the bridge is cut a certain way, it will become easy to play without hitting other strings. Also the neck, my $1600 violin has a very clunky neck. Unfortunately, I bought it when i started back in 2004, thinking buy the best i could afford and that European was the only kid in town. Well that just isn't so anymore. Many fine violins are coming out of China. Some junk ofcourse. That's why when the Fiddlerman played the CM on youtube and i saw the price, i thought, how can i lose?. Mom didn't raise no dummy, ha ha. I'm not going to mention the company that sells the $1600 violin, which i check the price is now over two grand. It just wouldn't sit well with me to bad mouth them. I'm sure they mean well, but it just isn't as good as what's coming out of China now. Not just my opinion, a few players have said so also. I believe, as a student, you don't have to spend a lot to get a good violin. If you can get to a shop and try them all the better, but i think this is a good way to go. One other point i forgot to make... these CM violins are handmade. You can tell that right away, you could never get a handmade violin 8 yrs ago for this kind of money. Yes i stated the CM was easy to play. What i mean by that is a hard thing to explain. What it comes down to is the feel of the neck in your hand and the bridge angle. If the bridge is cut a certain way, it will become easy to play without hitting other strings. Also the neck, my $1600 violin has a very clunky neck. I believe, as a student, you don't have to spend a lot to get a good violin. If you can get to a shop and try them all the better, but i think this is a good way to go. One other point i forgot to make... these CM violins are handmade. You can tell that right away, you could never get a handmade violin 8 yrs ago for this kind of money. Thank you for your advice and comparison. I can relate to the neck, bridge curve and height. Some of them are much better to play. I actually prefer lower bridge, lower string height myself. It's easier on my fingers. Differences between instruments so far as string height above the body, action (string height above the fingerboard), curve of the bridge and thickness from the back of the neck to the surface of the fingerboard are all factors where there probably is no true "best". It is about what you like and what suits the sort of playing you want to do the best. For example, a higher action allows for playing louder and more powerful notes, because the string has more space to vibrate before it hits the fingerboard. A lower action will work better for most players for being able to play fast, though, simply because you don't have to move the string as far to finger each note. Low action will be more comfortable, but a player with strong fingers can get an advantage in what the maximum volume of the instrument can be and that equals more dynamic range to work with. Which one is best depends on what you want, and the "correct" height for the action is basically a recommended compromise. Height of the strings above the body (how tall the bridge is) affects the relationship between the vibrating string and the body. The main and most noticeable effect is that if the strings are higher above the body then the instrument will favor the treble range and if it is lower, it will vibrate a bit better in the low ranges. Since the neck angle on violins is not user adjustable and the action also depends on it, that can be a reason to pick a particular one, although from what I understand luthiers can break the neck loose and then modify it and reattach it to get a desired angle. This is oversimplifying for the sake of brevity and only mentioning a few obvious characteristics that such changes affect. But the point is, what is "best" will vary a bit between players. Tom,, you posted in another place that you suffer from carpal tunnel syndrome. Perhap's other's didn't see it. It's possible you may want to go with a lighter gauge string which will be more responsive, easier to press down, but will possible give you a little less volume. All string's react differently on each violin. The lighter guage string also give's you a faster action. You can also mix the tension of your string's, maybe a light tension for A-D and the medium tension for the G.
I think, if you use the lighter guage string that you will not want to lower the bridge, due to string vibration, the lighter the string the more clearance you need between string and fingerboard, I think. I posted in your introduction thread that I also have the Concert Master violin and absolutely love it. I have switched string's on it two time's already, trying to find which one's work the best for me. I removed the original string's that were on it when it was shipped, replaced them with Zyex and have just switched to the "helicore" to kind of brighten it up a little. Whatever work's best for you. thanks folks for the replies. I've alway stuck with medium on strings, but i never gave it much thought. Next order i may try light. CTS is bad enough but arthritis on top of that is a real bummer. I get some good days and that makes playing so enjoyable. Yes i'm loving the CM more each day. I have a set of zyex ready to go and lol i ordered Helicores a few days ago. We must be on the same wave length. Hi folks, sorry i don't post much and i haven't been around. I'm heavy into daily chores. Work, wife with her need to do this and that and little time for practice. What time i have is practice new tunes and such. Just thought i'd chime in. It's about two months since i recieved the Concert Master Violin. It has opened up nicely, sounding better all the time. Nice and powerful. I've got as much power as my buddy has with his very expensive French violin. He had commented to me how sweet sounding and easy to play mine was in comparison. I love this fiddle, it just keeps on surprising me with it's sound price ratio. it's tops. Thanks for your updated post as I hadn't read your original comments and replies until now. Great to hear your relatively inexpensive violin has turned out to be a winner. I wonder if you tried Zyex yet, from the Helicores you mentioned were on order and/or if you tried a light version of strings and if so did that help your playing. this is for Steve. Yes i tried Zyex strings. i left them on for three days and hated them. They are super loud to the point of being ear painful. Sorry Fiddlerman, i know you love them. Just didn't work with this violin. They may work with another CM violin. That's the way wood is. I settled on Prim strings. The fiddle just sounds wonderful and responsive with them. This is my string and i don't think i'll change to any other. The Helicores were ok, but Prims just work great, not just to my ear, but others have told me they love the sound. That will be useful info for anyone, so glad you provided it. I personally have not noticed great differences between strings except between nylon-core strings and steel-core strings and for which I've always preferred nylon-core. But that's why so many different types of strings are manufactured, everyone usually has a preference. Glad you found strings that suited you and your fiddle! Thanks for the great review. Do you mind if I put that review with the product on FiddlerShop.com? Fiddlerman, you're welcome to use my review. I love this violin and that's from the heart, by the way, the strings that come with the CM violin are pretty good, but i wanted a more fiddling sound so Prims fit the bill.